With this onslaught of rainy days, and more rainy days, and more rainy days, it brings out the baker in me. Even if you don’t consider baking to be among your greatest skill sets, I have a comforting recipe that’s really easy and perfect to make on days like today. My passion is to help people make high quality foods more convenient, and this recipe can be one of your go-to snacks for healthy munching. So let’s practice making unhealthy foods 20 seconds harder to get to; stash the chips in hubby’s car trunk, up on a high shelf, or simply resist buying it to begin with. And let’s make healthy food more convenient by making this great new recipe to have on hand. Now this isn’t just any granola recipe because it’s more of a savory than sweet flavor and I’m excited about it because I designed it this morning. It turned out light, crunchy and savory with an undertone of sweetness from the honey and tartness from the cranberries. This can be made gluten free by buying gluten free rolled oats which are grown in dedicated fields so there is no cross-contamination. And of course, you can substitute the cranberries if you have a favorite alternative. The spices I selected are typically of Indian dishes; you can also substitute with sage, thyme, basil, etc. Experiment and have fun! Pre-heat oven to bake at 300 degrees. Mix all dry ingredients in a bowl and set aside. Whisk together wet ingredients in smaller bowl. Combine all ingredients, tossing until moist and crumbly. Pour ingredients onto a parchment-lined cookie sheet, spreading out evenly. Bake on top rack just until lightly browned, around 18 minutes. Allow to cool completely and enjoy on yogurt or by itself. 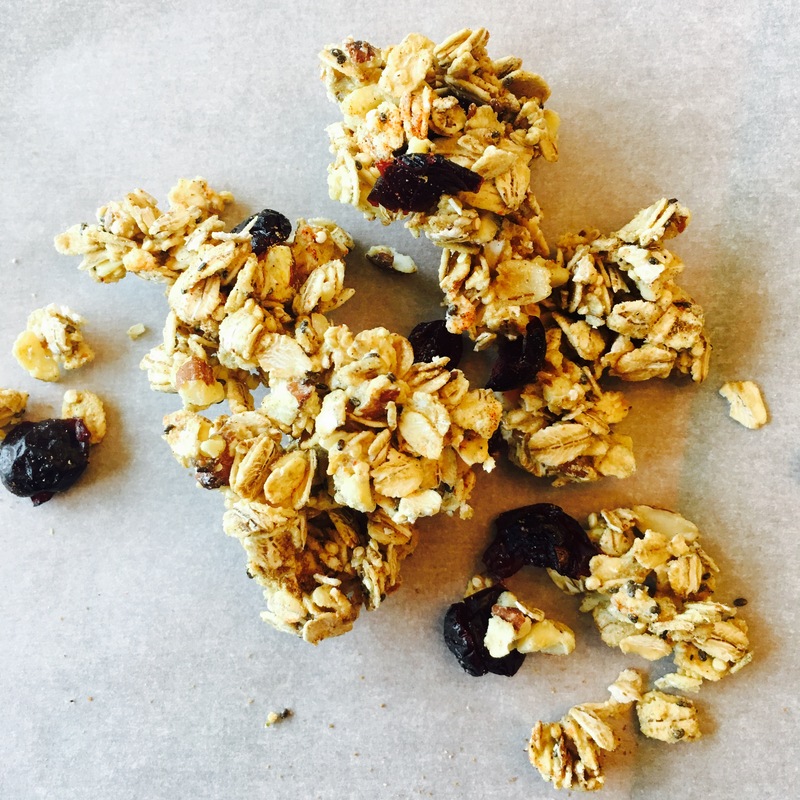 Please share this with your friends who would enjoy this healthy and fun protein granola snack!